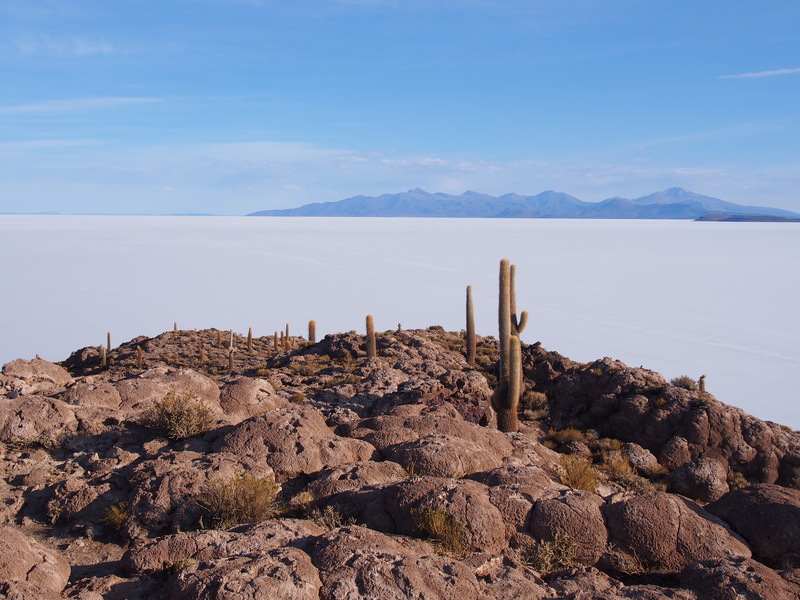 The Southern Altiplano is the region south of La Paz, it has quite a harsh geography with deserts, mountains, volcanoes, glaciers, rock formations appearing out of nowhere and the seemingly endless salt flats. 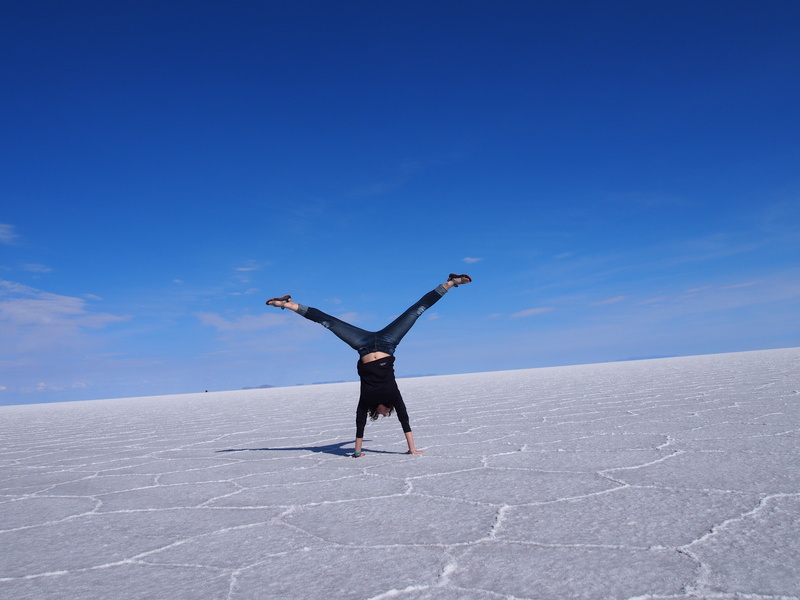 Uyuni is the gateway to popular area of the Southern Altiplano, the salt flats. 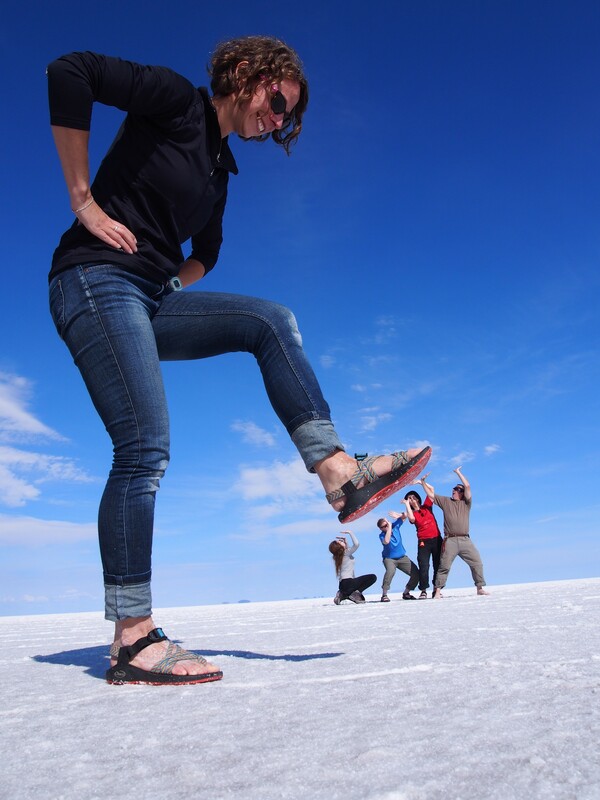 Uyuni is about a 10 hour drive from La Paz, we did it as a combination of bus and then jeeps. It’s quite a dinky little one horse town, but has it’s own charm. 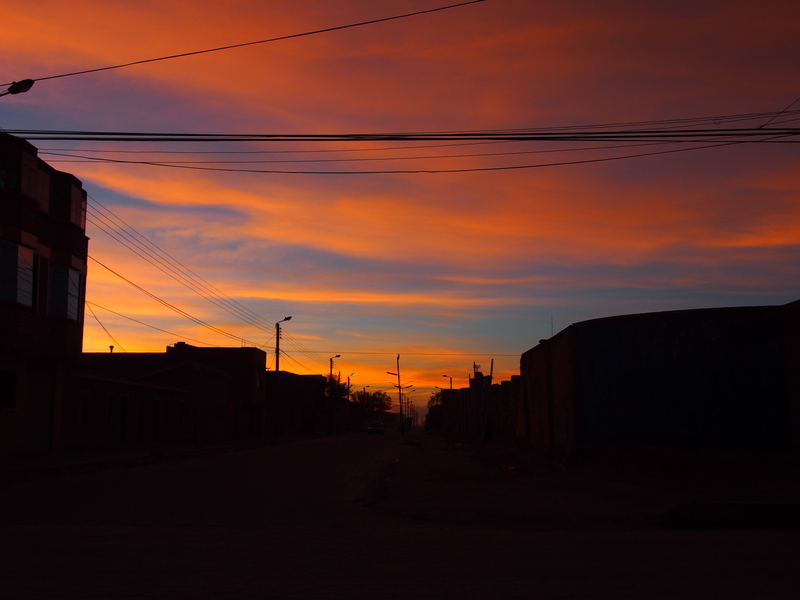 From Uyuni most people head out on a three or four day jeep trip around the highlights of the area. Our tour group did a three day tour. While there are many awesome things to see and it’s definitely well worth the time and money, be aware that these trips are predominantly driving. The first stop is the train cemetery. The trains were used by mining companies but when the industry collapsed, the trains were abandoned. I thought it sounded uninteresting when I heard we were headed there, but once I got there, I actually found it really interesting. 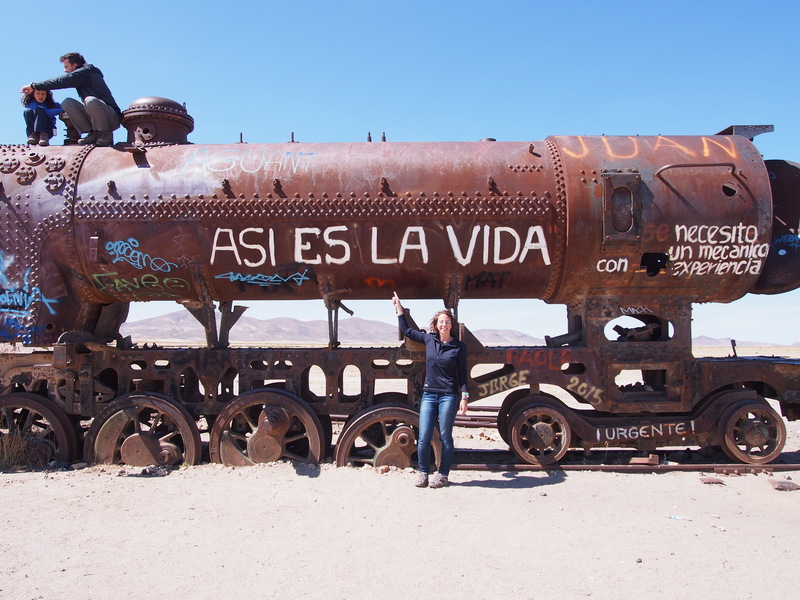 There were so many trains and many of them had cool graffiti on them. It was kind of like an adult playground. The second stop was a brief visit to a town called Colchani. This is where the salt from the salt flats is processed and packaged. On our very brief visit the processes were explained to us and the packing was demonstrated. This was absolutely 100% the highlight of the trip for me. 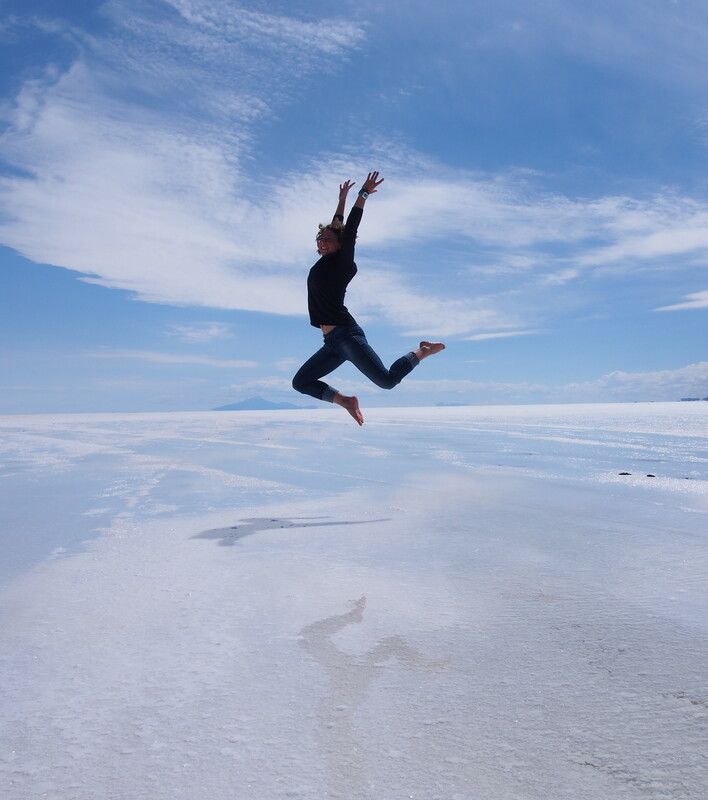 The salt flats stretch for kilometres and kilometres (12,106 square kilometres) at an altitude of 3653metres. While all these kilometres of salt flats are basically all the same, I never tired of looking at them. The parts that are under water provide awesome reflections and the dry parts have really cool polygon patterns in them. It was also crazy to realise that in some places the crispy layer of salt was only about 10 cm thick, and if you broke the crust there were a few metres of water below. 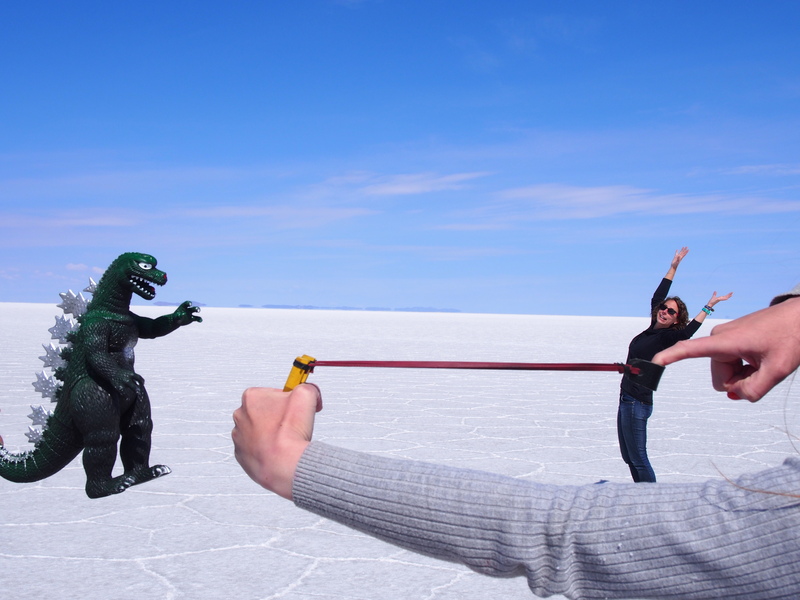 Because of the extensive salt flats, all looking the same, you can create really awesome pictures using perspective. I had an absolute blast taking quirky pictures. In the middle of the salt flats, randomly popping up out of nowhere is an island, Island Inkawasi. It is covered in really old cacti and was really awesome to see. We did a short hike to the top of the island and had a fantastic view over the salt flats. We finished the first day of the jeep tour in a salt hotel called “Marith En” in a town called Atulcha. I was so excited to stay in a salt hotel, such a novelty!! In reality they look quite dirty and are cold. But hey, I stayed in a salt hotel!! The second day of the tour had many short stops. We saw the smoking volcano Ollagüe. It’s an active Volcano that is partly in Bolivia and partly in Chile. 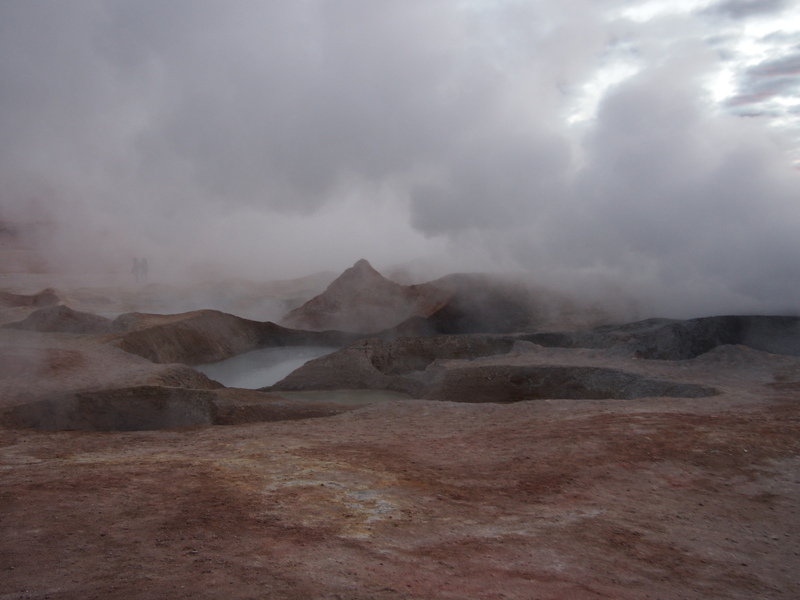 It last erupted 100 years ago. 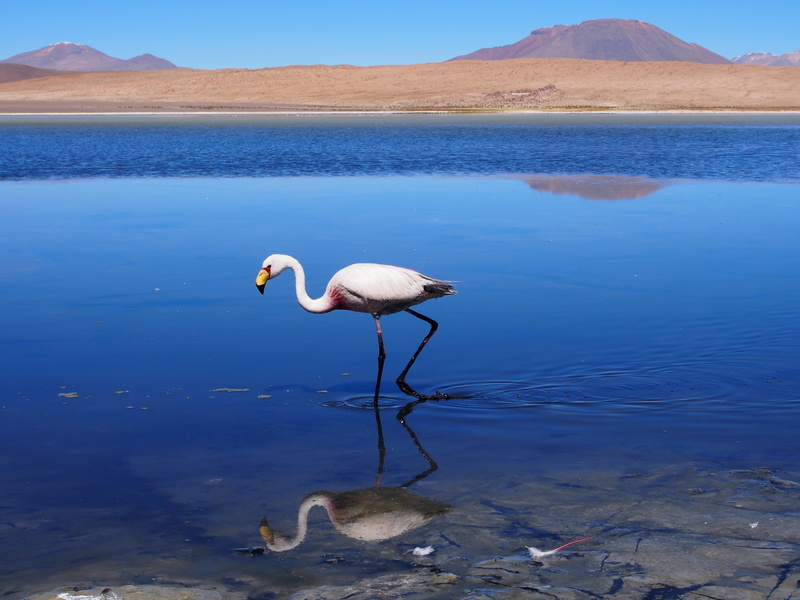 There were four lakes: Laguna Cañapa and Laguna Hedionda, which are both known for their flamingos. We drove past, but didn’t stop at Laguna chiarkhota, The last lake was Laguna Honda, known as the romatic lake, as it is in the shape of a heart (Though I feel that required some imagination to see). We drove through the dusty dry Siloli Desert and saw a fox and a viscacha (a Bolivian bunny type creature with a long tail). We made a brief stop at the mountain of seven colours, our altitude at this point was 4741m. 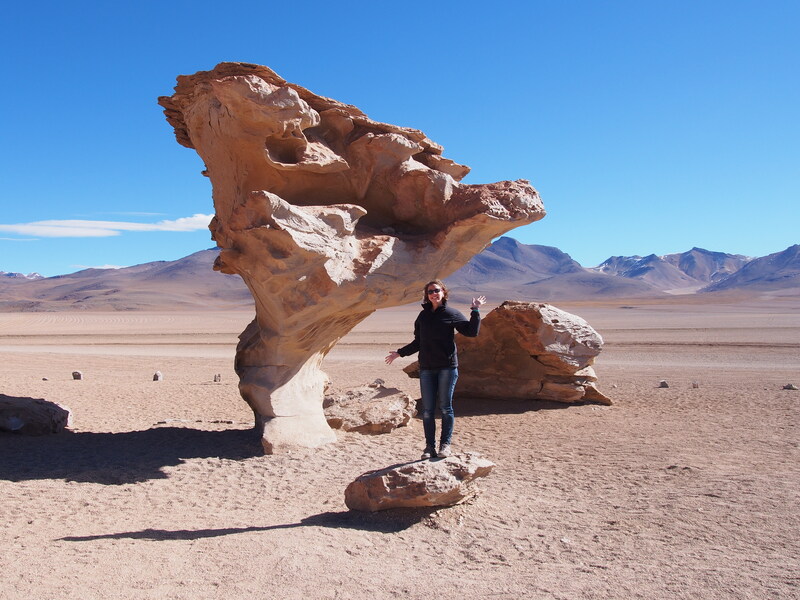 We made another stop at some geological rock formations, the most famous of which was the Arbol De Piedra, tree stone. A rock that has been carved into a tree shape by the wind over many years. We visit one last lake, Laguna Colorada, which is bright red from all the microorganisms living in the water. It was quite cool to see. 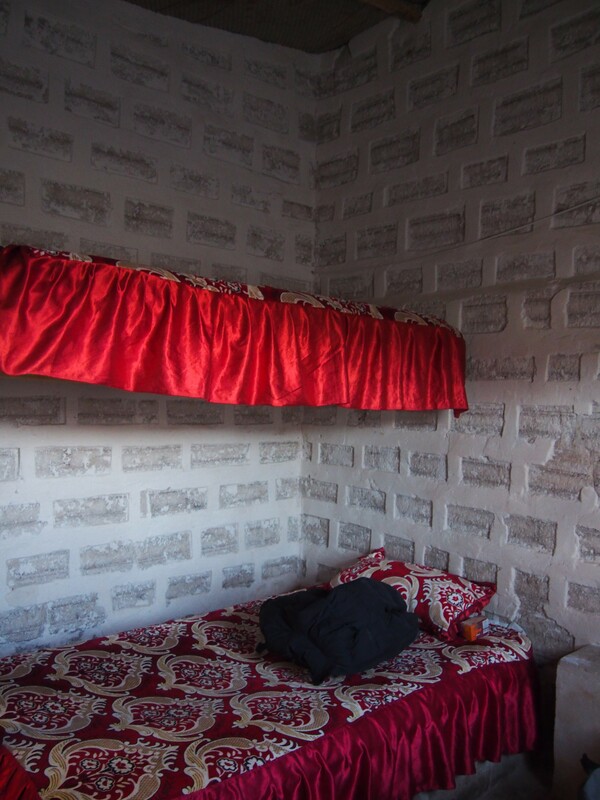 We spent the night in dormitory accommodation in a tiny town called Huallajara. Our altitude here was 4230m and it was cold!!! 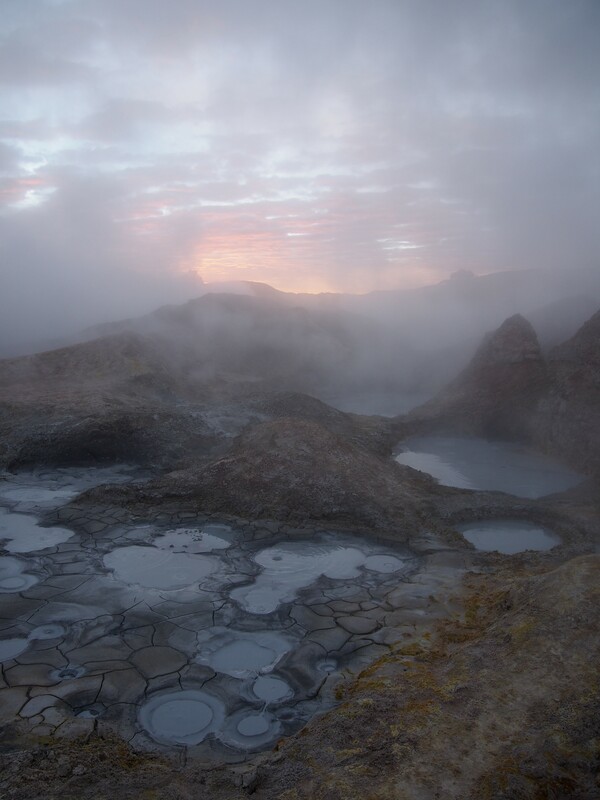 We started the morning well before sunrise and headed to Sol de Mañana (Morning Sun) to view the sunrise as well as the mud bubbling sulphur pools. 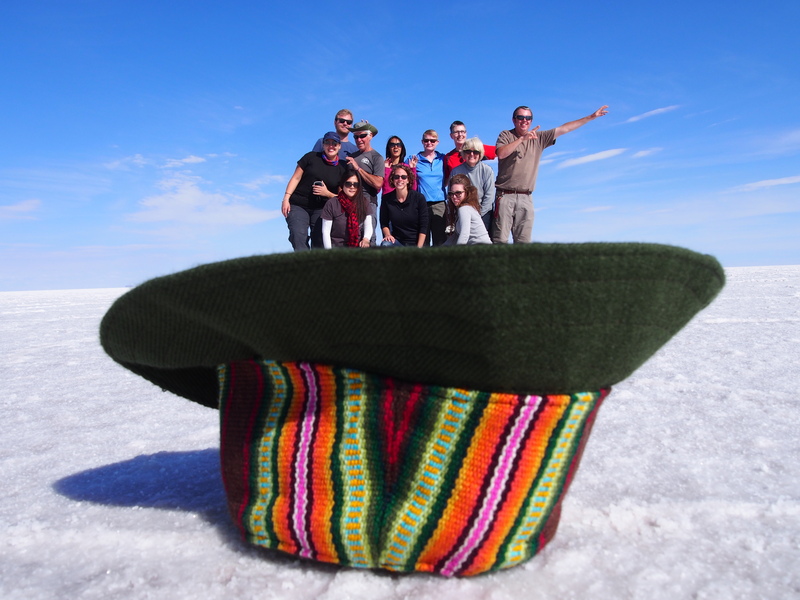 This was the highest point in the journey at 4912m and it was freezing cold! The mud bubbles were eerie to watch, they stank, but they were quite spectacular to see. Even more spectacular was the sun rise which could be seen through the steam clouds. 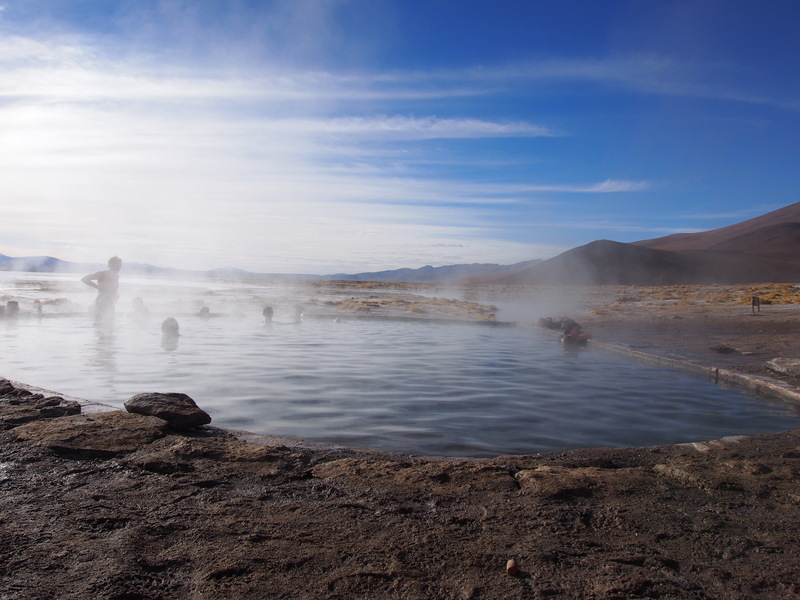 After the mud bubbling pools we headed to the hot springs at Polques where we had some breakfast and then some people hopped into the 39 degree hot springs for a soak. While the hot springs sounded appealing, the idea of getting out and having to dry off in temperatures around 9 degrees was not appealing, so I settled for soaking my toes in the warm water. 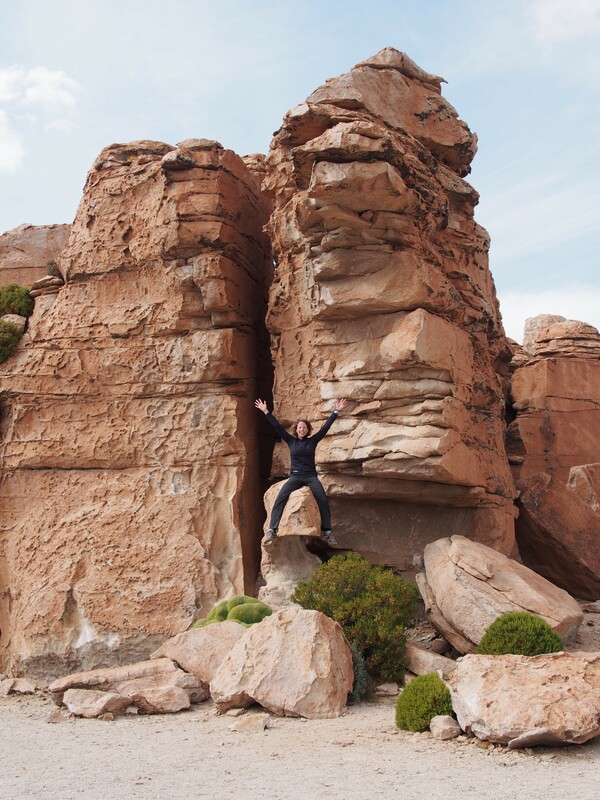 The next stop was a stretch of desert called Salvador Dali Valley. It was thought that the artist Salvador Dali visited this desert and it inspired many of his artworks, most notably his melting clock. We then made a quick visit to Green Lake. Though it’s no longer green. An earthquake in Chile in 2014 somehow caused the copper (the source of the green colour) to dissipate. 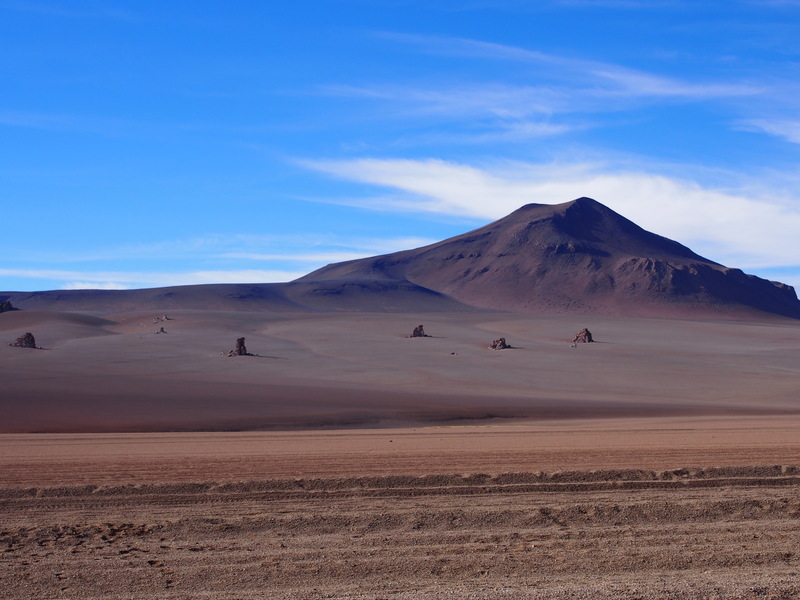 The last stop before arriving back in Uyuni was Valle Ve Las Rocas, another geological fault which caused rock formations to pop up out of nowhere in the desert. They were pretty cool to look at too. Driving through the desert unsurprisingly results in dust, which causes you to cough and to sneeze. Something I learned about sneezing in South America is that they don’t say bless you, that’s not the surprising part. If you sneeze consecutive times, they say something different each time. The first sneeze they say Salud, which means health. The second sneeze, they say Dinero, which means money. The third sneeze is Amor, meaning love. So if you sneeze three times consecutively you are wished health, money and love. For all my pictures, check out my Flickr album. Ahhh chew… Ahhh chew ….Ahhh chew.